Penelope Shuttle was born in Middlesex but has lived in Cornwall since 1970. She is the widow of the poet Peter Redgrove, (1932-2003). Shuttle’s most recent collection, Redgrove’s Wife, appeared in June 2006 from “Bloodaxe Books” and was short-listed for the Forward Prize for Best Single Collection, and for the T S Eliot Award. She is a tutor for The Poetry School, The Arvon Foundation, Second Light Network, and Lapidus, and runs residential courses in Spain at Almaserra Vela (April 2009) and in France at Chateau Ventennac ( April 2010). She has read her work at many venues, including the Aldeburgh, Ledbury, Stanza, Strokestown and Cuisle Festivals. In the autumn of 2007 she was one of three poets on an Arts Council sponsored reading tour of Toronto and New York. Her new collection Sandgrain and Hourglass, which will be her tenth, appears from “Bloodaxe Books” next year. 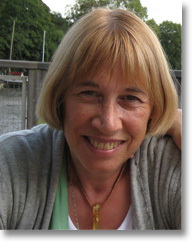 She is currently a judge for the T S Eliot Award 2009. She is a Hawthornden Fellow. In 2007 she was awarded a Cholmondeley Award for Poetry.